Each morning, our operations staff (namely, Richard Vangilder - richard.vangilder@state.co.us) gets up early and assembles the DEM Daily Update for emergency management staff. Over the past few months, DEM has also been making this info available to the general public. The intent of the daily update is to have a one-stop reference tool each morning to get a big-picture of emergency management-related activities in Colorado. 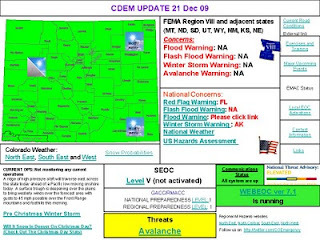 The update includes an overview of any ongoing operations, weather assessments/overviews assembled directly from National Weather Service reports, and information regarding national, regional and Colorado threats and emergency operations activation status. The DEM Daily Update also contains information regarding upcoming Colorado training exercises, significant events, and a variety of links for more detailed information. The update is posted each morning, usually around 9:00 am to the DEM web site at http://dola.colorado.gov/dem/dailyupdate.pdf. Check it out!